First of all download and install the virtual box. On a Windows host, in the standard “Programs” menu, click on the item in the “VirtualBox” group. On Vista or Windows 7, you can also type “VirtualBox” in the search box of the “Start” menu. On a Linux or Solaris host, depending on your desktop environment, a “VirtualBox” item may have been placed in either the “System” or “System Tools” group of your “Applications” menu. Alternatively, you can type VirtualBox in a terminal. 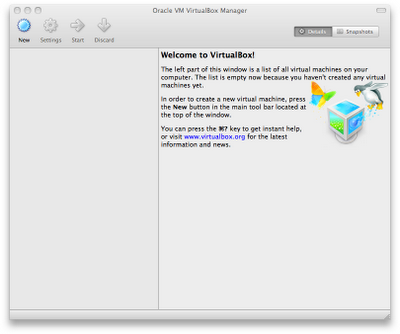 This window is called the “VirtualBox Manager”. On the left, you can see a pane that will later list all your virtual machines. Since you have not created any, the list is empty. A row of buttons above it allows you to create new VMs and work on existing VMs, once you have some. The pane on the right displays the properties of the virtual machine currently selected, if any. Again, since you don’t have any machines yet, the pane displays a welcome message. The VM name will later be shown in the VM list of the VirtualBox Manager window, and it will be used for the VM’s files on disk. Even though any name could be used, keep in mind that once you have created a few VMs, you will appreciate if you have given your VMs rather informative names; “My VM” would thus be less useful than “Windows XP SP2 with OpenOffice”. For “Operating System Type”, select the operating system that you want to install later. The supported operating systems are grouped; if you want to install something very unusual that is not listed, select “Other”. Depending on your selection, VirtualBox will enable or disable certain VM settings that your guest operating system may require. This is particularly important for 64-bit guests (see the section called “64-bit guests”). It is therefore recommended to always set it to the correct value. On the next page, select the memory (RAM) that VirtualBox should allocate every time the virtual machine is started. The amount of memory given here will be taken away from your host machine and presented to the guest operating system, which will report this size as the (virtual) computer’s installed RAM. Choose this setting carefully! The memory you give to the VM will not be available to your host OS while the VM is running, so do not specify more than you can spare. For example, if your host machine has 1 GB of RAM and you enter 512 MB as the amount of RAM for a particular virtual machine, while that VM is running, you will only have 512 MB left for all the other software on your host. If you run two VMs at the same time, even more memory will be allocated for the second VM (which may not even be able to start if that memory is not available). On the other hand, you should specify as much as your guest OS (and your applications) will require to run properly. A Windows XP guest will require at least a few hundred MB RAM to run properly, and Windows Vista will even refuse to install with less than 512 MB. Of course, if you want to run graphics-intensive applications in your VM, you may require even more RAM. So, as a rule of thumb, if you have 1 GB of RAM or more in your host computer, it is usually safe to allocate 512 MB to each VM. But, in any case, make sure you always have at least 256 to 512 MB of RAM left on your host operating system. Otherwise you may cause your host OS to excessively swap out memory to your hard disk, effectively bringing your host system to a standstill. 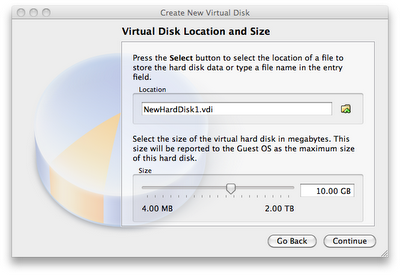 There are many and potentially complicated ways in which VirtualBox can provide hard disk space to a VM (see Chapter Virtual storage for details), but the most common way is to use a large image file on your “real” hard disk, whose contents VirtualBox presents to your VM as if it were a complete hard disk. This file represents an entire hard disk then, so you can even copy it to another host and use it with another VirtualBox installation. 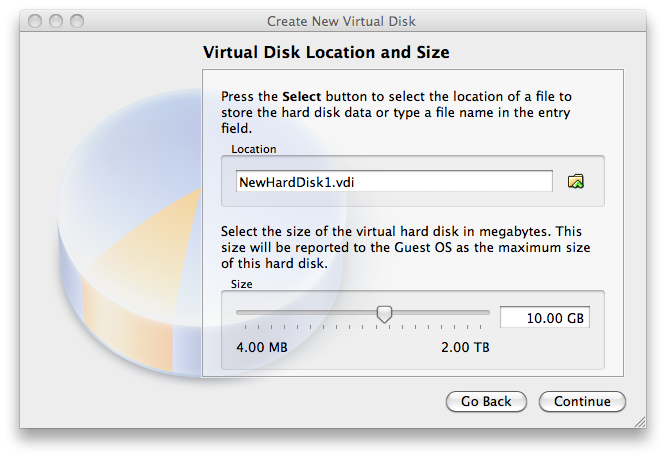 To create a new, empty virtual hard disk, press the “New” button. 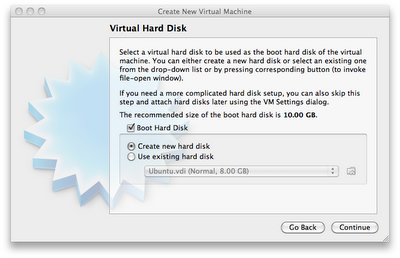 The drop-down list presented in the window contains all disk images which are currently remembered by VirtualBox, probably because they are currently attached to a virtual machine (or have been in the past). Alternatively, you can click on the small folder button next to the drop-down list to bring up a standard file dialog, which allows you to pick any disk image file on your host disk. 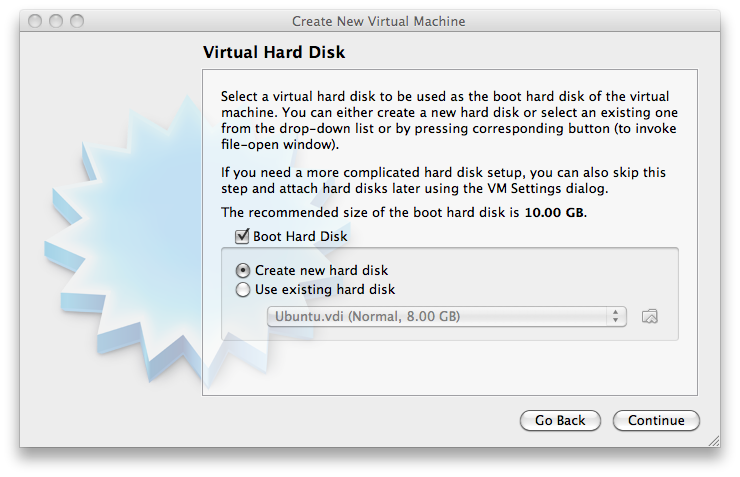 Most probably, if you are using VirtualBox for the first time, you will want to create a new disk image. Hence, press the “New” button. 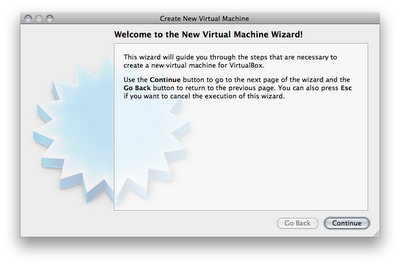 This brings up another window, the “Create New Virtual Disk Wizard”, which helps you create a new disk image file in the new virtual machine’s folder. 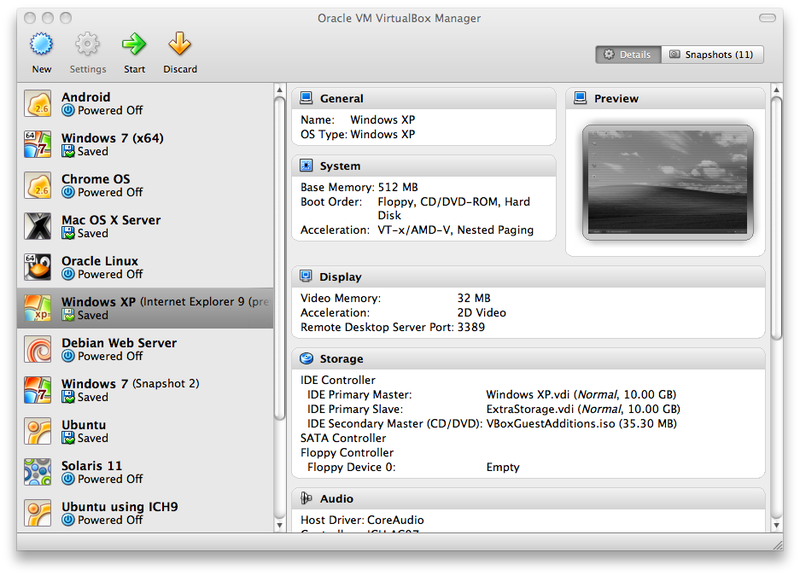 When you select a virtual machine from the list in the Manager window, you will see a summary of that machine’s settings on the right. Clicking on the “Settings” button in the toolbar at the top brings up a detailed window where you can configure many of the properties of the selected VM. But be careful: even though it is possible to change all VM settings after installing a guest operating system, certain changes might prevent a guest operating system from functioning correctly if done after installation. The “Settings” button is disabled while a VM is either in the “running” or “saved” state. This is simply because the settings dialog allows you to change fundamental characteristics of the virtual computer that is created for your guest operating system, and this operating system may not take it well when, for example, half of its memory is taken away from under its feet. As a result, if the “Settings” button is disabled, shut down the current VM first. 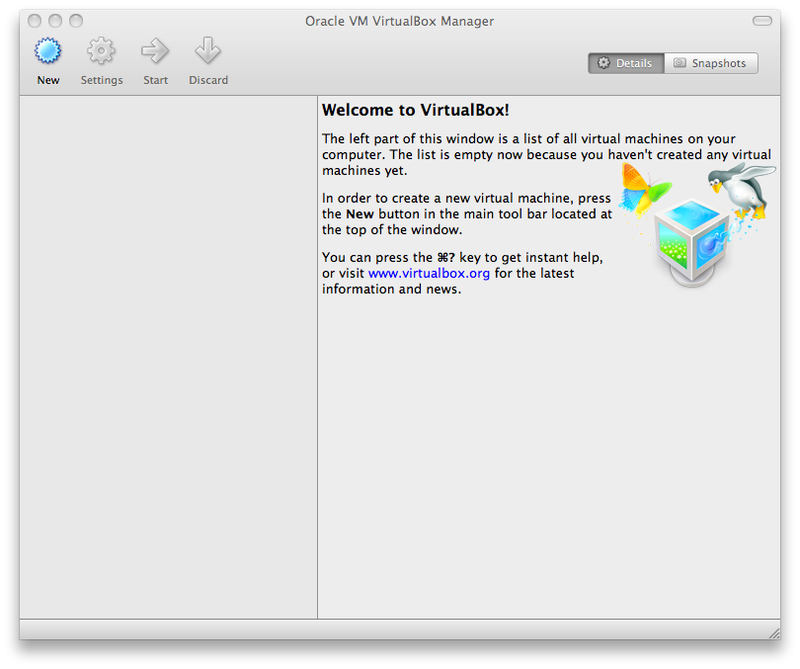 VirtualBox provides a plethora of parameters that can be changed for a virtual machine. The various settings that can be changed in the “Settings” window. 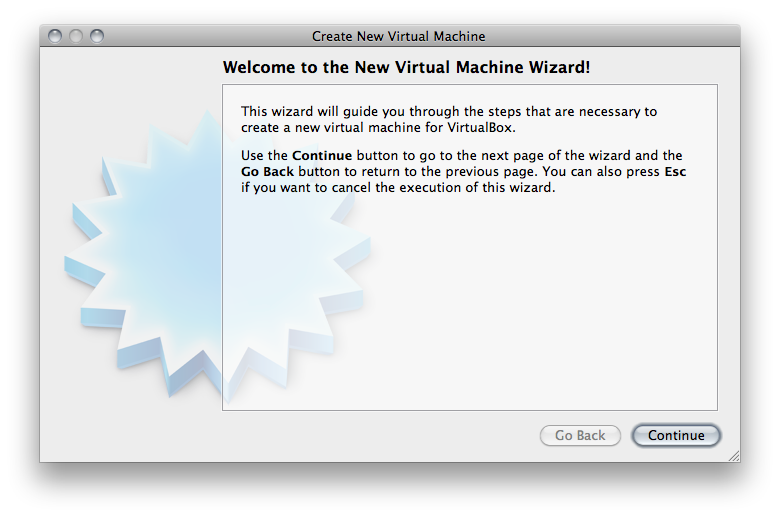 When a VM gets started for the first time, another wizard — the “First Start Wizard” — will pop up to help you select an installation medium. Since the VM is created empty, it would otherwise behave just like a real computer with no operating system installed: it will do nothing and display an error message that no bootable operating system was found. If you have physical CD or DVD media from which you want to install your guest operating system (e.g. in the case of a Windows installation CD or DVD), put the media into your host’s CD or DVD drive. Then, in the wizard’s drop-down list of installation media, select “Host drive” with the correct drive letter (or, in the case of a Linux host, device file). This will allow your VM to access the media in your host drive, and you can proceed to install from there. For this case, the wizard’s drop-down list contains a list of installation media that were previously used with VirtualBox.